Mom and I took a week off from the blog to enjoy the fall weather. We took my girls to the park, played tennis, walked, hung out with friends and family, and of course watched football. But that doesn’t mean we haven’t done any sewing at all! This finished quilt’s colors are inspired by The University of Georgia Bulldogs – Red, Black and White. The pattern we chose is gingham. We used 4″ blocks consisting of red and black small gingham print by Riley Blake designs and our go-to white: Kona White. We stitched in the ditch and then added additional quilting on either side to give the quilting added texture. The back is so cute. It’s Vintage Market in Red and White by Riley Blake Designs. I just love the little shops and handmade images! The finished quilt measures 44” x 52” – perfect for a toddler bed, infant play mat or tailgate blanket. We have listed this quilt in our shop. 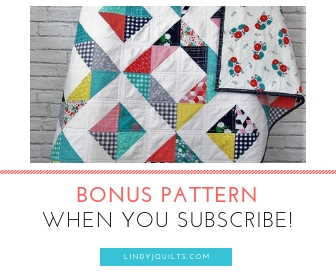 If you like the quilt but need it in a different size or in different colors, check our custom quilt listing. We would love to create a quilt just perfect for you. It was nice to take a little break, but we have several unfinished projects that are calling our names! Be on the lookout this Friday for our next school’s quilt top fabrics. We should have that top ready by Sunday. Until then, take care and have a great week!